But for an industry predicted to employ as many as 300,000 people by 2020, according to analytics firm New Frontier Data, the majority of jobs in the field will pay relatively low wages and require little skill. Jobs like budtender and bud trimmer, entry level positions, will make up the vast majority. Bud trimmers prepare marijuana plants for retail sale. They get paid on average between $8 to $12 an hour, according to Jacob Silverstein, a former marketing manager for the Las Vegas dispensary ReLeaf who is currently a cannabis industry consultant. "It takes all of 10 minutes to train someone to do it properly and it takes an hour to get proficient," he said. Budtenders, who sell marijuana to customers at dispensaries, typically make about $14 an hour. The job requires an in-depth knowledge of cannabis strains and products and a bartender-like rapport with customers. In Colorado and also Michigan, where medical marijuana is legal, budtenders are required to have licenses. To be sure, there are a handful of jobs that will pay well. But they require science and engineering knowledge. The greatest demand, according to James Yagielo, co-founder and owner of the Florida-based headhunter HempStaff, is for master extractors. They process the active components THC and CBD from marijuana and hemp to make oils, concentrates, edibles and other products. The master extractor at Acme Elixirs, a producer of THC and CBD chews and vape pens, earns $250,000 a year, said founder and CEO Peter Pietrangeli. But he said that even with that level of pay it's hard to recruit and keep these workers "because after a while they'll get the funding to build their own labs." Becoming a master extractor requires a PhD in biochemistry with a background in engineering, which means there's a small pool. "This is a rat race for talent," said Silverstein. He said job seekers with degrees in botany, chemistry or pharmacology are the next generation of master growers and lab directors. 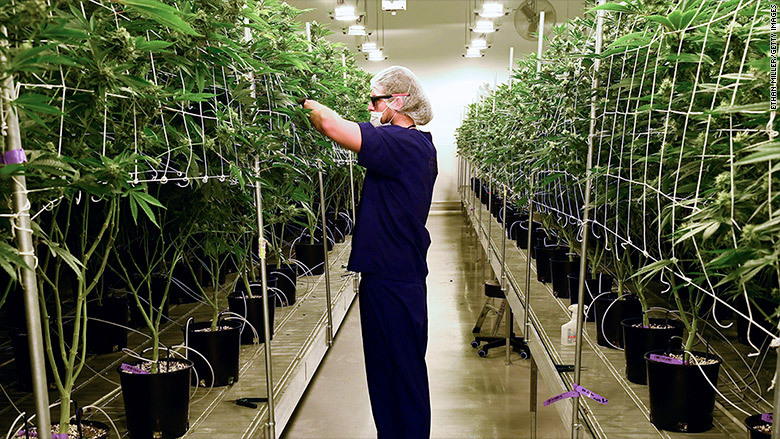 Like master extractors, lab directors and master growers can earn big dollars. "I know some master growers who make more than $200,000. They're valuable," said William Simpson, CEO of Golden Leaf Holdings, an Oregon-based chain of dispensaries, cannabis farms and manufacturers. "That is going to be a very sought after, difficult position." Elad Spiegel, director of cultivation and breeding for Golden Leaf, said his annual pay is $120,000. He has a bachelor's in plant science from Hebrew University in Jerusalem and started working in the cannabis industry in his native Israel before joining Golden Leaf in 2015. Yagielo of HempStaff said entry level pay for growers is typically $40,000 a year for horticulturalists, or $60,000 for botanists, but pay can grow to $120,000 within three years. He said that pharmacologists might start at $40,000 managing a dispensary but they could eventually make $100,000 by managing several for a dispensary chain. But the people who make the most money in the industry aren't the ones who are getting hired; they're the ones creating the jobs. Being an entrepreneur requires a lot more risk than getting a job, especially in an industry that's considered illegal by the federal government. But the pay-off, if it all works out, could be lucrative. "The best paying job?" said Simpson. "Go get a business degree and start your own company."